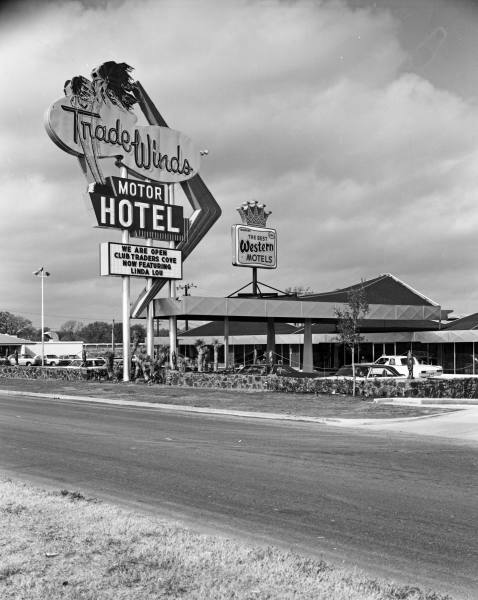 The Tiki Nook Club was located in the Trade Winds West Motor Hotel at 51st and Peoria, south of I-44, on the other side from the Camelot Inn. The Tiki Nook's owner and operator? Former Claremore police officer and artist Morse Purkey, who was an acquaintance of the creators of the Kon-Tiki Koni. Mr. Purkey passed away in 2007. Here is his memorial. Must have had one too many Mai Tais at the Tiki Nook Club; I can't remember very much about it today, except that the band was usually "Front Page News" in 1983. 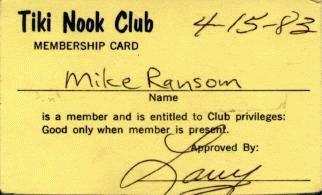 Check out more Club Cards. 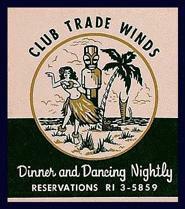 Around 1960, when the Trade Winds opened, the restaurant/club was known as Club Trade Winds. 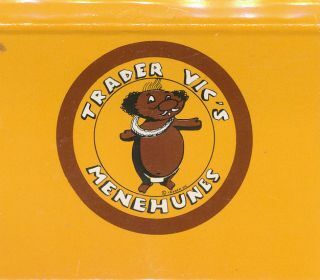 Ray Stoll: "It was originally planned to be the ultimate in Polynesian-style restaurants, to surpass and become the superior successor to the then-popular Trader Vic restaurants." by Frankoma Pottery in Sapulpa, Oklahoma (near Tulsa). 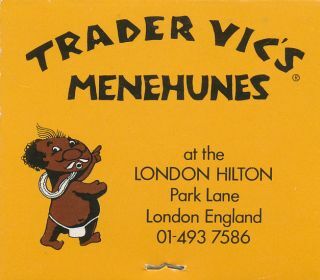 From the webmaster's 1985 visit to Trader Vic's in London. Next, the Trade Winds' club became Club Traders Cove. Trade Winds West became the site of KAKC's broadcast studio during its Top 50/Big 30 heyday (60s-70s). 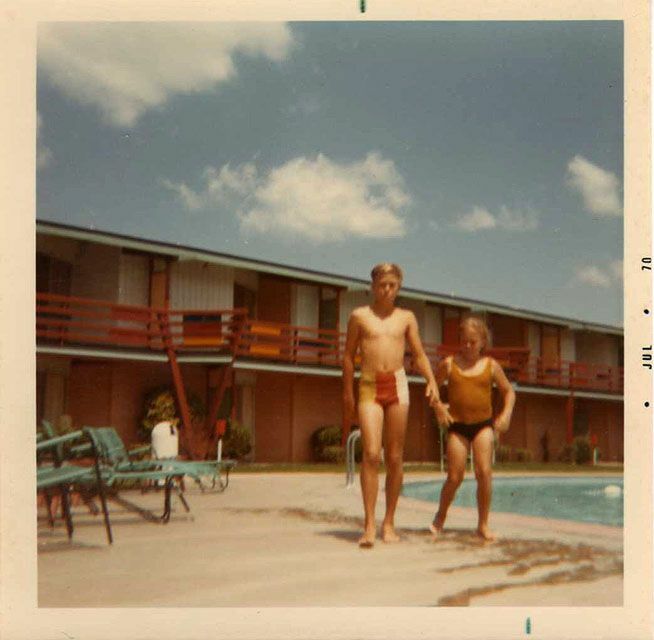 Pertaining to the Trade Winds West, one summer when I was a kid, my old lady took my brothers and me there to swim. While she had the lobby door open for us to go in, out came Carl Wilson of the Beach Boys. I didn't realize who he was at the time, but my brother recognized him immediately. Enraged by this opportunistic behavior, she let go of the door, which caught old Carl in the gut. One of the Beach Boys right behind him witnessed this incident, and, filled with remorse, held the door for her. *Tim is the individual who hassles me about Jade East. inside singing, not realizing they were playing records."